Every high school student will read a Shakespeare play at some point. And how teachers approach Shakespeare initially will make or break that relationship with the Bard. Think about Romeo and Juliet. The play opens with a fight scene in which a lot of the action is implied, there are a bunch of randy jokes, and the main characters aren’t immediately introduced. And the language! We can’t just assume students will figure this stuff out. They’ll need help. Maybe for the entire play. But fortunately we can front load our reading with some basic skill building that will help students before they read a word of Shakespeare. So here are 4 essential skills students should have under their belt before they read Shakespeare. You can start introducing this concepts as bell ringers while you’re finishing up the unit before. That way they’ll be ready to go. Shakespeare frequently puts words in a strange order so the sentence follows a particular rhythm, like iambic pentameter. Here’s an example from Romeo and Juliet. How would you reword the following sentence so that it looks like it would normally appear? Give student a few inverted lines from Shakespeare’s plays and give students practice understanding them. I’ll ne’er look you i’ the face again. You can have students practice these words by writing sentences of their own which use as many of these words as they can. There are plenty of other techniques that Shakespeare uses in his writing (figurative language, allusions, iambic pentameter) all of which can be taught before and during the reading of a play. I have created a set of Shakespeare Skill Builder Bell Ringers that work with any Shakespeare play. With just five minutes a day you can provide your students with the extra practice they need to tackle the Bard in 25 lessons. All the work has been done for you. A lot of students can use whatever help they can get understanding Shakespeare, so I’ve developed comics and activities for a few frequently taught plays, like Romeo and Juliet, Macbeth, A Midsummer Night’s Dream, and Hamlet. Many teachers have found them valuable for comprehension, plus they’re fun! For most students “Romeo and Juliet” is their first exposure to Shakespeare’s language. And if you don’t set them up properly, Shakespeare can seem too difficult and before you’ve gone too far, you’ve lost them. So what’s the best place to begin? It isn’t with Act One. Act One begins with a bunch of jokes and puns that the students won’t understand. There’s a fight, but there’s not enough stage directions to truly understand what’s going on. The main action and dialogue is done through people that for the most part won’t appear in the play again. I usually show the Zefferelli version of the play to introduce the conflict, but we don’t read it. I don’t even start with the prologue. I have found that the best place to start with Romeo and Juliet is the most important and famous part: the balcony scene. You have arguably the most famous line in the play (“Romeo, Romeo, wherefore art thou Romeo?”) and an opportunity to talk about how words in Shakespeare’s time may not mean what you think they mean (“Wherefore” means “why.”) You have another famous line (“A rose any other name would smell as sweet”) that introduces the central conflict of the play. You’ve also got a terrific line for introducing the concept of iambic pentameter (“But soft! What light through yonder window breaks?”) that is also a good example of how Shakespeare inverts word order to preserve the rhythm of the line. There are a couple of easy to understand metaphors (Juliet is a bright angel, her eyes are stars, and a bunch of others). All of this will get kids on the right foot with the text. The balcony scene is the perfect entry into Shakespeare’s language. Once you’ve done this, you can go back to the beginning of the play with students that are prepared for the complexities of the world’s greatest love story. If you’re looking for other fun ways to get students involved with Shakespeare and Romeo and Juliet, check out my “Romeo and Juliet: Comic Summaries and Activities.” I have created cartoon summaries of each act to help kids understand the play: there are even “Easter eggs” hidden in them of some of the metaphors and images in the play. There are also warm up activities included for each act. No matter which play you’re doing, you’ll want to introduce students to the world of Shakespeare. My “Shakespeare Activities Bundle” collects some comics and activities on Shakespeare’s life and times, iambic pentameter, and Sonnet 18. Or, if you’d like both, you can get them both in this bundle for a discounted price. I can’t say that I’ve ever been invited to a cocktail party. I don’t think it’s because I’m not popular (although that could indeed be the case.) I don’t think that it’s because I’m an English teacher and people don’t want to watch the way they talk after a few drinks. I honestly think that nobody really holds cocktail parties anymore. But you can still buy fun cocktail napkins plenty of places, so even though people may drink beer and wine instead of sidecars and boilermakers, festive and funny cocktail napkins are always held in high regard. 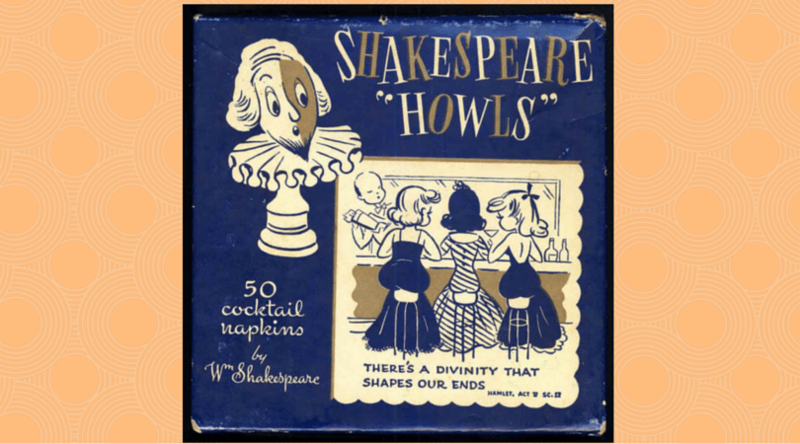 In the fifties cocktail napkins with cartoons were pretty easy to find, but here’s a real oddity from that era: cocktail napkins with cartoons featuring Shakespeare quotes. This set of 50 napkins had 20 different cartoons which you can see below. It’s really difficult to figure who drew them, but nevertheless the artwork is a top-notch example of fifties cartoons. I have to wonder who would have bought these. They don’t seem to have a wide appeal except for amongst the literary or those who want to impress other with their intelligence. If you’d like to buy some for your next engagement, you can pick up a vintage set on ebay or etsy for about $30. I draw funny Shakespeare cartoons too! Check out my Teachers Pay Teachers store for fun comic resources like those below. I have taught Romeo and Juliet so many times in my career that I don’t have to read it anymore to teach it (isn’t that a great place to be?) However, there’s always something new to discover in the play. For instance, I read recently that all the good stuff in the play happens at night and all the bad stuff in the play happens during the day. I never noticed that before! It’s a terrific play that my freshmen enjoy. They like the story even if they struggle with the language. They rise to the challenge. For many of them Shakespeare is something you should do in school, so they don’t put up too much of a fuss. However, one area is always struggled with was how to introduce each act so that they had enough information to understand what was going on, yet not so much that reading the play became unnecessary. Also, I am always looking for something to make Shakespeare more accessible. So I made the following set of comics. The comics above are from Romeo and Juliet: Comic Summaries and Activities. 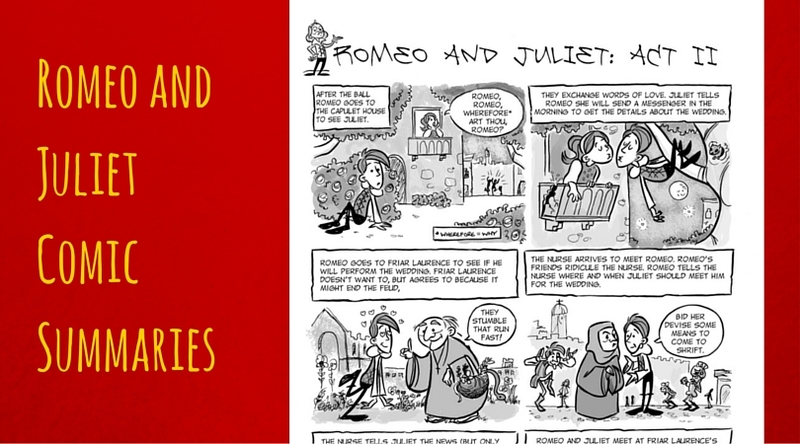 The comics provide an overview of what happens in each act of Romeo and Juliet. They are a fun alternative to handing out summaries of the acts. For one thing, they don’t give too much away. Second, I have hidden Easter eggs throughout the panels of metaphors and images from each act (for instance, if you look closely at the last panel, you’ll see a “rich jewel in an Ethiop’s ear” on the floor.) The back side of these cartoons have activities centered around the work that will get kids interacting with the text without the use of No Fear Shakespeare. For example, an activity from Act One has students looking for book imagery as they read Lady Capulet’s description of Paris. Of course since this is the students’ first exposure to Shakespeare, you’ll need to introduce the bard and do a warm-up activity or two. I have a set of Shakespeare Bell Ringers that introduce students to the language of the bard. 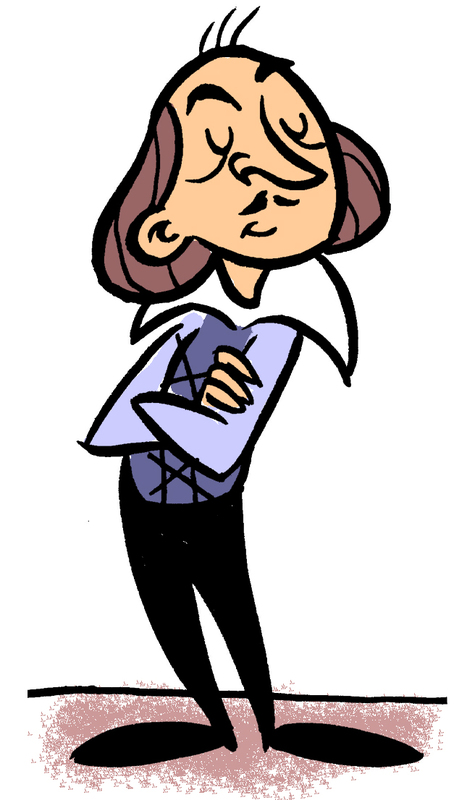 Also, if you want a FREE comic that introduces Shakespeare and provides a little more background and an activity with a sonnet, click below and you’ll get it! If you’d like even more fun things you can do with Shakespeare, you can find them in my Shakespeare activities bundle, which includes the Shakespeare biography, a lesson on iambic pentameter, and a lesson on Sonnet 18. The packet contains a cartoon that explains the poem as well as comprehension activities and lessons on the sonnet form. Check it out at my store. Look for more Shakespeare Comics coming soon.